Gina Nucci, Mann's director of corporate marketing, explained that the produce company doesn't want to perpetuate a fear that something is wrong with GMOs. SALINAS, CA: One year ago, Mann Packing went through the process of getting some of its vegetable products Non-GMO Project Verified. Now, the company is trying to distance itself from non-GMO labeling. 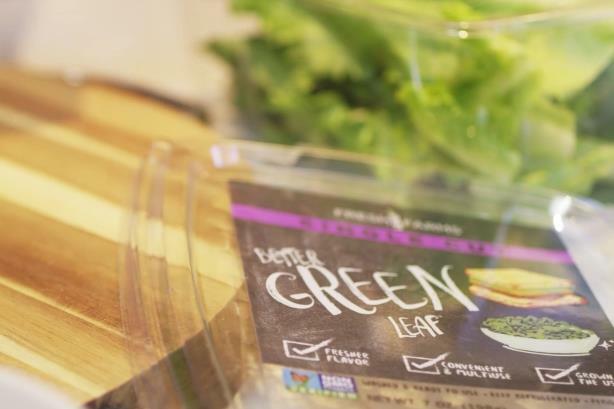 The company is removing the non-GMO verified check from its single-cut lettuce products in its next print run, which could take place next month, said Gina Nucci, Mann’s director of corporate marketing. Mann did an about face after presenting its product packaging in Canada, where the Non-GMO Project Verified label is only allowed on products that have a GMO alternative. "There is no GMO lettuce," said Nucci. "It made us go: Why are we doing this? We are perpetuating a fear that something is wrong with GMOs. We didn’t feel right doing that, so we chose to take that label off." Mann sells other products that do not have the non-GMO verified check, but include copy stating they are GMO-free on the packaging. Nucci said the company is discussing removing that, as well. Nucci said Mann is not proactively communicating about its stance on GMOs, but it isn’t hiding its opinion either. If people reach out with questions, its comms team responds. One consumer recently complained to Mann’s Fresh Vegetables on social media about how "disappointed" she was to see the non-GMO label on the company's products. Mann wrote back, publicly stating that it would be removing the labeling from its products. "I am not doing a press release that we are making this stance, but we are pretty vocal about this," said Nucci. "We participate with The Alliance for Food and Farming; I speak on panels about focusing on facts, not fear. In the community and in the agriculture world, we are active about this." Nucci added that the company is aware it has customers who want their products to be GMO-free. Mann gets about three calls per week on its 1-800 number from people asking if its products have GMOs. To contend with this, the company created an FAQ page. She explained that Mann’s approach is all about giving consumers all the facts "so they can make the best choice for them." Nucci said she’s seen more and more companies adding non-GMO labels to their products. She added that Mann believes GMOs are good for the public and will eventually help farmers use fewer pesticides and herbicides. "[Non-GMO labeling] is at a point where it has gotten out of hand," said Nucci. "There is non-GMO water, non-GMO salt, non-GMO cat litter; it is ridiculous. We want to nip this in the bud and educate people about GMOs, non-GMOs, and hybrids. Because that uneducated consumer is the one that is just going to hear the buzz and follow the lead." Last month, the National Milk Producers Federation launched a campaign called Peel Back the Label to highlight the trend of what it calls "fear-based food labeling." A 2016 study by Consumer Reports found that 70% of consumers use front-of-package information when deciding whether to buy processed foods for the first time. Food manufacturers are capitalizing on this, The National Milk Producers Federation said in a release, by placing more labels on products that state "GMO-free" or "hormone-free," to play on consumers’ food-safety fears and misconceptions. On the Peel Back the Label website, consumers have access to the tools they need to "separate hype from fact as they work to make informed food decisions for their families," the federation said in a statement. It also describes how consumers can tell their own stories about the negative effects of deceptive labeling and share information on social media. "This kind of deceptive and fear-based labeling by food companies has become so pervasive that many consumers aren’t even aware it is happening," said Amber McDowell, spokesperson for Peel Back the Label. "Our challenge with Peel Back the Label is to help consumers do just that: peel back the label on the foods they purchase every day and show them that food companies are using their own misconceptions about particular foods against them in order to increase their market share." McDowell added that transparency is particularly important in a campaign like this. Its campaign team is using strong visuals that connect consumers with the highlighted product and help them immediately understand "the deception that is happening every day on just about every grocery aisle in America," said McDowell. The Peel Back the Label website and social channels feature visual case studies of brands taking part in "food label fear mongering." "Our visual case studies have proven to be the most persuasive and engaging content we’ve featured so far as part of the campaign," McDowell said. "We are also enlisting consumers in our efforts to shine a spotlight on these bad actors by asking them to share their own examples that they find of fear-based labeling and marketing." A Facebook page for the campaign has about 20,000 followers. McDowell said it is a platform consumers look to and trust for this kind of information. Late last year, Hunt’s added a "GMO-free" label to its canned tomatoes. This story was updated on October 5 to clarify that in Canada, the Non-GMO Project Verified label is only allowed on products that have a GMO alternative.